An interesting duality in these two cards: two eights, two titles starting with an I. Interference and Indolence stand together as barriers, obstacles. 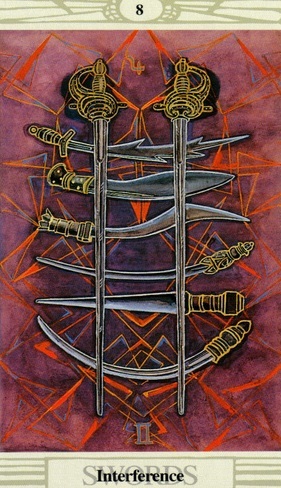 In the 8 of swords we have blades of various sizes line up, crossed by two straight rapiers. All of them have a certain almost translucence quality to them, as if they were made of glass, made of something not quite real or solid. They seem to block the way to something - but what? Behind them the background seems violent, chaotic - dark violet with what looks like angry sparks of red energy. Even the air here is difficult to bear. Astrologically we have Saturn in Gemini here - that half-wild, disorganized brilliance thrown into a tizzy by a negative, unexpected influence. Communication has been disturbed, perverted, twisted until it hurts instead of helps progress. The air sign did not have a strong enough foundation, and now it spins off-course. The mind is sharp, full of wit, quick on the uptake with many things, but also terribly liable towards distraction, towards spirals of self-defeat and negativity, towards exaggerations of problems, impossibility. In the eight of cups we have a similarly disheartening scene. 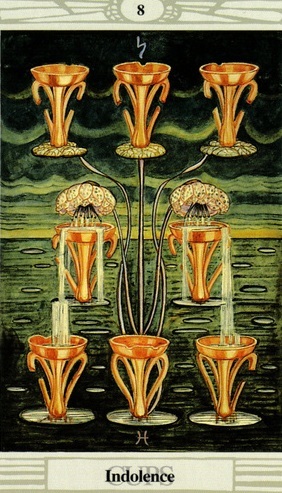 The cups here stand in a symmetrical pattern still, tied with vines and flowers, but this card is far removed from some of the others in the suit. Here the cups are chipped, broken in numerous places. The lotus flowers room as if dying, perhaps poisoned or corrupted by the inky black waters below. The sky too is almost black, full or storms and cold and lack of light. 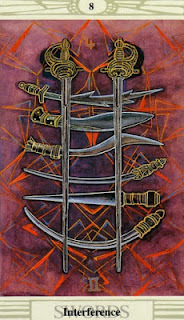 Despair seems to be the mood here, and this card, like the previous, is also ruled by Saturn. Saturn in Pisces, here - deep emotion turned to melancholic, spirituality affected by hopelessness, compassion burned out. Indolence, giving up because why bother and it is easier to do nothing and simply watch things fall apart, wrapped up in dread of the inevitable. Focusing on the sorrow, the listlessness, the heavy clouds that linger always overhead. The feeling of too many obstacles and difficulties, too much unknown and already ruined and hopeless, both on intellectual and emotional levels, could be quite problematic indeed. And what to do about that? Go on. 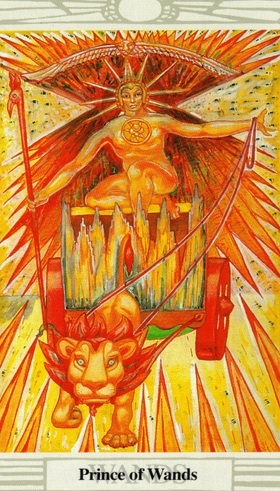 Push forward with chariot pulled by the confident lion, surrounded and blazing with fiery light. Light so bright that it could burn your retinas, that it could not possibly be real, you say looking at it, pondering it. Fake light, make it real because you need to to be light, fake it till you make it light and what does it matter in the end, the nature of it and where it might come from and why? It shines, a contrast to the grim muddled darkness of the two eight cards. We have motion here, so much movement - not static despair but action, momentum. Go forward with confident air, hold wand of authority in hand and a rein, go. Push forward, through and beyond. See and feel and think of the Interference and Indolence but do not be held back by them, slowed down or stopped. Move through them, hopefully beyond them. Keep going even if they are still there. Cancer and Leo influence - creative passion, a balance of introvert and the people person facade. He can be reckless sometimes, to a fault, but perhaps sometimes recklessness is the lesser evil: better to move wildly than to not move at all, to remain in the same, bitter place. Let restlessness drive you, harness those impulses and that inner energy and push through, even if you don't quite know where you are going. Lovely! Please keep reading with Thoth! I got the DuQuette book at last and am puzzling through it. I intend to draw with Thoth again next week. I may do readings instead of daily draws. The deck is becoming more and more attractive to me. I know--go on and laugh!